Lemon bars have a special place in my heart because they conjure up some fond memories of when I started baking. My parents weren't into baking since their catering focus was all about cooking. So when I started baking in my mid-high school years, it was like uncharted territory in our family kitchen. My mom was always hesitant about me baking in her kitchen so I had to either wait until she was out of the house or at work. One of the first things I made were lemon bars. Why lemon bars? I got tired of spending money buying them at the Corner Bakery, which was directly across from where I worked at the mall. I wanted to try my hand at baking them from scratch to see if I could replicate the lemon bars I've grown to love at the Corner Bakery. Needless to say, making them from scratch was always better and much more fun. Combine the three ingredients in a bowl to form a soft dough. It's especially important that the butter and cream cheese is at room temperature so it's easy to incorporate with the flour. Once you have your dough, you can form it into small balls and place in a mini muffin tin. You can then use your thumb to depress each dough ball so you have a little well to fill. Bake in a 350 degree oven for 10 minutes until the edges of the tarts are golden brown. Remove from oven and pan; allow them to cool completely. Heat the lemon juice in a small non-reactive saucepan over medium heat until hot but not boiling. Whisk the eggs and yolk in a medium nonreactive bowl; gradually whisk in the sugar. Whisking constantly, slowly pour the hot lemon juice into the eggs, then return the mixture to the saucepan and cook over medium heat, stirring constantly with a wooden spoon, until the mixture registers 170 degrees on an instant read thermometer and is thick enough to cling to the back of the spoon, about 3 minutes. Immediately remove the pan from the heat and stir in the cold butter until incorporated; stir in the cream, vanilla and salt, then pour the curd through a fine-mesh strainer into a non reactive bowl. Cover the surface of the curd directly with plastic wrap; refrigerate until needed or when tart shells have cooled completely. Carefully spoon the chilled lemon curd into each tart shell and top with fresh blueberries and sprinkle powdered sugar over the tarts before serving. I make lemon curd, too--same recipe originally, only I heat the lemon juice with 2-3 packed teaspoons of lemon zest to punch up the lemon flavor w/o significantly increasing the tartness, then double the sugar and the butter. It's fabulous on waffles! I'll try it in mini-tarts. Thanks for the idea--and the dough recipe! Lemon bars are one of my favorites! I love your mini version and think this would be perfect treat to bring to my coworkers next week! What a creative spin on lemon bars! 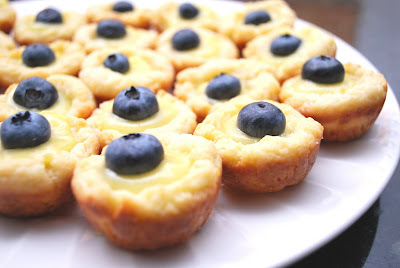 And the lemon/blueberry pairing is one of my favorites. I'm going to have to get a mini muffin pan one of these days - Those look like such lovely bite size treats!